Manchester United haven’t just made the best actual start to the Premier League season but also the best relative start when the difficulty of their fixtures so far is considered, according to analysis by sportingintelligence. Manchester City have made the second-best start, also over-achieving against what might have been expected, although nowhere near as much as United. Tottenham have had a better relative start than Chelsea, according to our analysis, while Wigan would be bottom of a ‘weighted’ table instead of Bolton. Sunderland and West Bromwich Albion are also in relegation form rather than above the drop zone, by our reckoning. 1) When the fixtures for the 2011-12 season were released in the summer, we calculated which teams had the easiest starts and which teams had it much tougher, according to opponents in the opening stretch of seven games before this current international window. A table of the cushiest starts from June is linked here. Aston Villa have had the cushiest start, not meeting a single team from last season’s top six finishers yet. By contrast Bolton have had the toughest start by far, already having had to face five of last season’s top six including champions Manchester United, runners-up Chelsea, third-placed Manchester City, fourth-placed Arsenal and sixth-placed Manchester City. Chelsea and City were not far behind Villa in cushy starts while United had the 15th easiest (and hence sixth hardest) start. 2) In the games so far this season, the 20 teams combined have shared 189 points. We have calculated where these points should have gone based on the toughness of starts, assuming (for a few equality-based minutes) that all things were otherwise equal in the Premier League. 3) Given their fixtures, United should have been winning a mere 1.25 points per game but in fact have won 2.71 points per game, for an overachievement of 1.47 points per game. City are also over-achieving but by nowhere near as much as United, while Tottenham are doing better than Chelsea, who are just ahead of Newcastle. 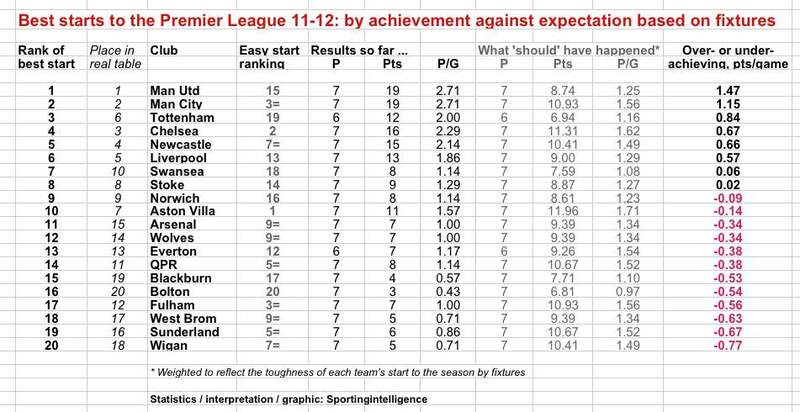 Only Liverpool, Swansea and Stoke are also doing better than they should be while 12 teams are doing worse. 4) Bolton are doing badly in reality, stuck on the bottom of the table with only three points but when the toughness of their start is factored in, they’re actually clear of the relegation zone, as are Blackburn. 5) If you were to think of the Premier League title race as a running event with staggered starts where true positions only become apparent when the stagger unwinds, the table below gives a hint of how things stand now. So Arsenal aren’t doing quite as badly as it appears but not as well as they should be. And Bolton’s position isn’t as dire as it seems. Stoke and Norwich are doing what we’d expect while QPR aren’t doing quite as well. The ‘Rank of best start’ is the best starts this season when weighted v fixtures. So Wigan have made a worse start in 20th place than Bolton (who occupy that place in the real table). Why? Because on this analysis, Bolton’s extremely tough start is taken into account, as is Wigan’s easier start. The ‘easy start ranking’ ranks the club by ease of fixtures. So No1 = Aston Villa = easiest seven opening games. While No20 = Bolton = toughest.